Are you looking for a new tent for your next camping trip? Would you like something that’s easier to set up than the tents you’re used to? Have you ever wondered which are the fastest tents to set up? If so, this article is here to help! Below, we have reviewed five of the fastest set up tent products on the market today. You’ll be able to check out a variety of different options and see which one is best for your needs. But does the amount of time it takes to set up a tent really make a big difference? In short, yes! Many campers are looking for tents that won’t take much time to get ready. This way, you can pop up your tent and spend more time enjoying the great outdoors rather than giving yourself a new hassle to worry about when you find the perfect spot to make camp. 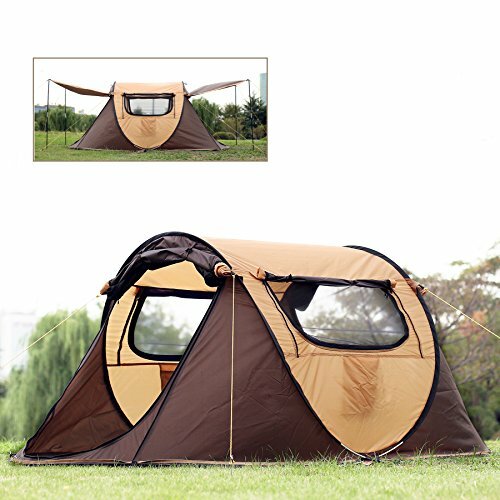 Pop up tents are also making it easier than ever for newcomers to the world of camping to enjoy their time outside. This is also a great way to get the kids in the family involved in setting up camp when the time comes, too. All in all, you can’t go wrong with an easy set-up tent. Check out our list below for several options to help you get started! With the Instant Setup One Piece Camping Tent, you can pop up your tent in just a few quick seconds and take it down just as easily. The tent has double layers for maximum protection from the wind and rain, and it features mesh windows on the sides and a roll-up door to make it even easier to breathe comfortably when inside. This tent is large enough for one adult to sleep in with no trouble. This tent is made of nylon that’s easy to keep clean and maintained well. It will only take a few seconds to set up this tent, even if you’ve never have practice with something like this before. The tent does not come with sealed seams, so if you want to seal them you’ll need to do this yourself. The tent may break easily under heavy winds in some rare instances. If you’re looking for something big enough for one person to spread out and have plenty of space to rest comfortably, look no further than the FiveJoy Pop Up Camping Tent. This tent, available in two colors, comes with large mesh windows built into three sides and one big roll-up door for easy access. This is a lightweight and airy tent that’s sure to please! This tent is just as easy to take down as it is to set up. The tent is lightweight enough to carry on a camping trip without overloading your backpack. The tent floor is a little thin, so you’ll need to put down a tarp underneath it to protect it (and you) from rocks. Although the tent is mostly waterproof, it may be a little damp on the inside if things get very wet outdoors. Sometimes you need a tent that’s big enough to fit more than one person but still easy to set up in just a few short seconds. If you find yourself faced with this type of dilemma, the Coleman 6-Person Instant Cabin is a great solution. 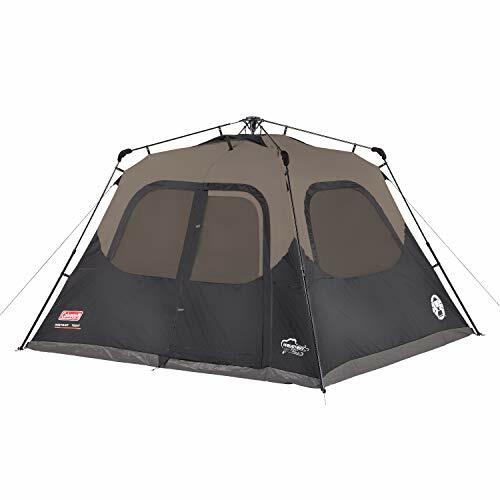 This polyester tent features reinforced seams to protect everyone inside from rain and wind, and it’s big enough for six people to sleep in with enough room to go around. 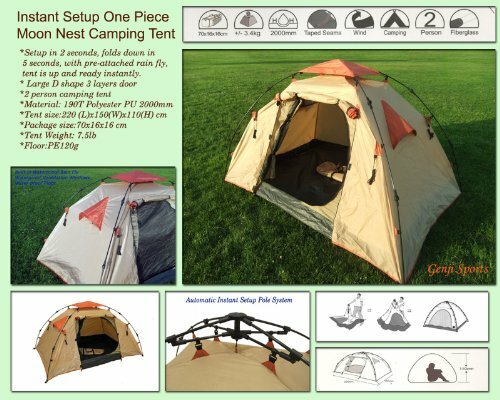 This is one of the best-selling pop-up tents on the market and has pleased hundreds of customers. When set up and staked properly, this tent is very resistant to the wind. Some customers have reported leaking problems when the rain reaches thunderstorm-level intensity, although not everyone seems to have this problem. The door closure has been known to break more quickly than anything else on the tent. Choose this Sixty Second Set-Up Dome when you need to sleep three adults or two adults and a child in efficient comfort. 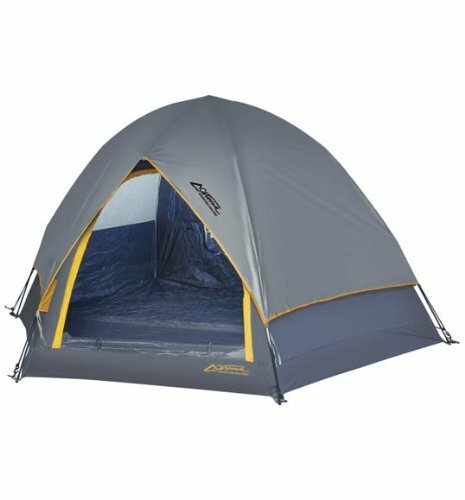 This tent weighs less than nine pounds and features durable reinforced taped seams on the floor and an easy-to-use zippered door. There is a single mesh window and a double layer of roof protection against rain and wind. This tent is lightweight enough to carry in a camping backpack with no trouble. The door secures safely shut and is easy to operate from inside. Some customers have reported this tent taking longer than advertised to set up, but it is still efficient overall. The tent may be a little thin on the bottom and require an additional soft surface to keep from feeling the ground beneath. 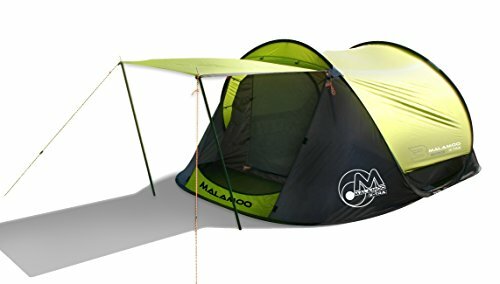 The Malamoo Xtra 3 Second Waterproof 3 Person Camping Tent is a spacious mid-size pop-up tent with roll-up doors on both sides and an attached shade for the front of the tent as well. Stretch out and enjoy all the space you and your fellow campers have to work with in this relaxing and easy-to-use tent. This tent is very waterproof and holds up well to a lot of use in light to moderate rain and wind. The tent is very airy and breathable whether the doors are open or not. The tent may be a little harder to take down than it is to put up, although it will be easy to get the hang of with some practice. This tent sleeps three but may be a little tight if the third person is not a child. Were you able to find the fastest tent to set up that will work for your needs? There are a lot of of options out there, but whether you’re looking for a one-person tent or something to sleep the whole family under one roof, you’re sure to be able to find it from the list above. Remember that all of these tents are high-quality and will help you better enjoy your camping trip overall. The choice is entirely up to you and your specific needs and requirements, so take your time and make the right decision! But what about the durability of these tents? Are they sturdy enough? Surely they can’t be as tough as the old-fashioned kind, right? Actually, they’re very sturdy, and as long as you stake them to the ground properly, you don’t have to worry about them blowing away in the wind or tipping over easily, either. These tents are sure to keep you and your whole family protected from the elements and sleeping soundly on your next camping trip!